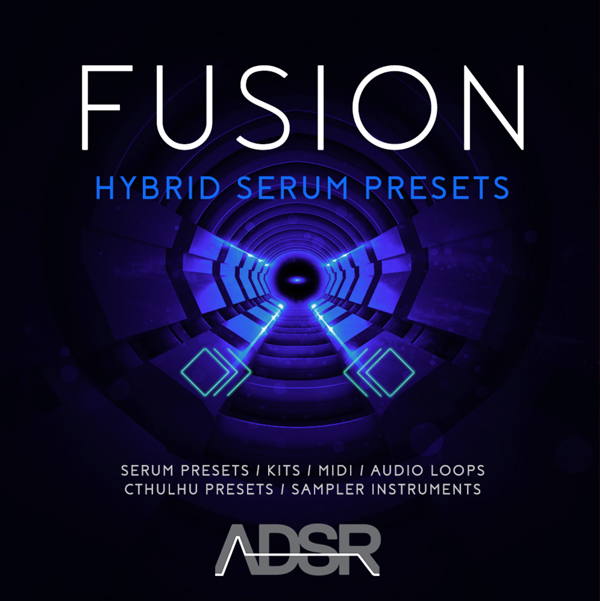 Fusion Hybrid Serum Presets from ADSR is the latest collection of presets to really blur the lines between synthetic and organic sounds. Featuring 50 inspirational presets for Xfer Serum it includes sub-basses with fluid LFO movements, textured keys, modded plucks, dynamic synths, vocal leads, a custom wave-tabled piano and guitar. Included are 3 full construction kits to really get your productions going in the right direction. These kits range between blissed out Future Bass, ambient electronic infused after-hours with smoothed out Future R&B elements. All kits are properly key labeled with BPM information and have their corresponding MIDI files for easy sound reassignment. Aside from the included construction kits, a folder of of individual customized Drum One-Shots have been included to easily load into your sampler of choice. To further spark creativity, 50 melodic sound elements have been included which range from orchestral strings, pizzicatos, wavy synths to infectious plucks and vocal leads. As an added bonus, 10 presets for the famed plugin Cthulhu have been included. Easily loaded these presets up within Cthulhu to reconfigure the chord progressions and or create completely new ones with a single finger key press. Content Notes: All the melodic content used in creation of the demo is available in the pack. Only a part of the drums used in creation of the demo are available in the pack.